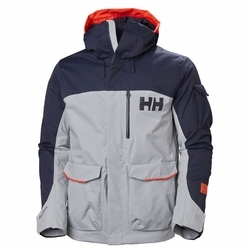 Helly Hansen Fernie 2.0 Jacket. From the first to the last snow of the season, the Fernie 2.0 jacket will always be a freeride jacket to come back to. The Helly Tech Performance 2L fabric will guaranteed keep you dry and comfortable no matter what adventures you might face and a PrimaLoft insulation will keep you warm on colder days. Large adjustable cuffs for easy use with gloves and other freeride specific features throughout including jacket-pant compatible powder skirt, higher collar, goggle shammy, and Recco advanced rescue system. Materials: Face: 100% Polyamide / Back: 100% Polyurethane | Insulation: Primaloft Black Eco Insulation 80g in body and 40g in sleeves and hood.